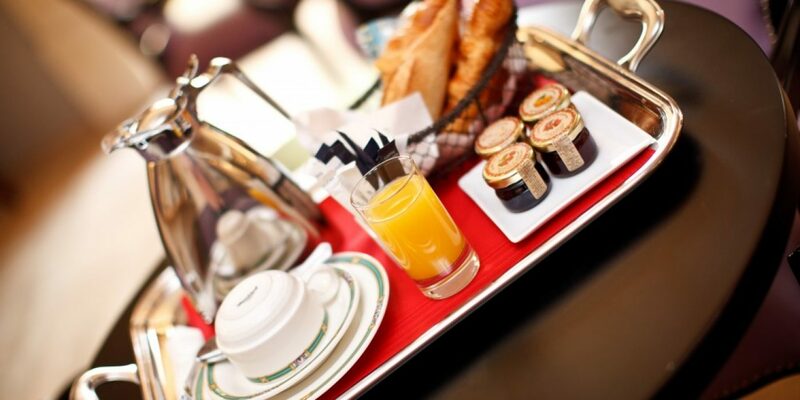 standard-title Breakfast Services For your breakfast, you can choose between room service (from 7am to 10.30am) or a buffet breakfast (on the ground floor from 7am to 10am - Rate 18 €). You will be given a wide choice of fresh products and served at will, this will delight the most gourmets of you. Our 2 new rooms have just been renovated in a beautiful period and contemporary, in perfect harmony with the style of the building. Parma and red bright colors, silver armchairs, all decorated with superb paintings, everything is assembled to spend a pleasant and refined moment around the Buffet in the morning! In season, our terrace is completely refurbished in an elegant "lounge", allowing you to enjoy a fresh air to wake up and the first rays of sunshine. 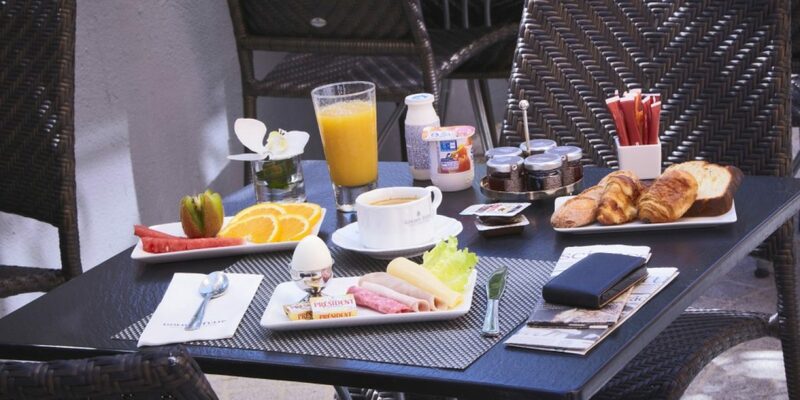 For your breakfast, you can choose between room service (from 7am to 10.30am) or a buffet breakfast (on the ground floor from 7am to 10am - Rate 18 €). 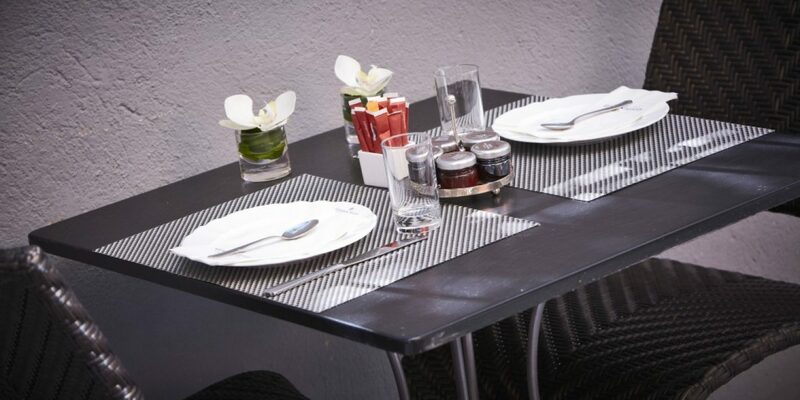 You will be given a wide choice of fresh products and served at will, this will delight the most gourmets of you. Our 2 new rooms have just been renovated in a beautiful period and contemporary, in perfect harmony with the style of the building. Parma and red bright colors, silver armchairs, all decorated with superb paintings, everything is assembled to spend a pleasant and refined moment around the Buffet in the morning! 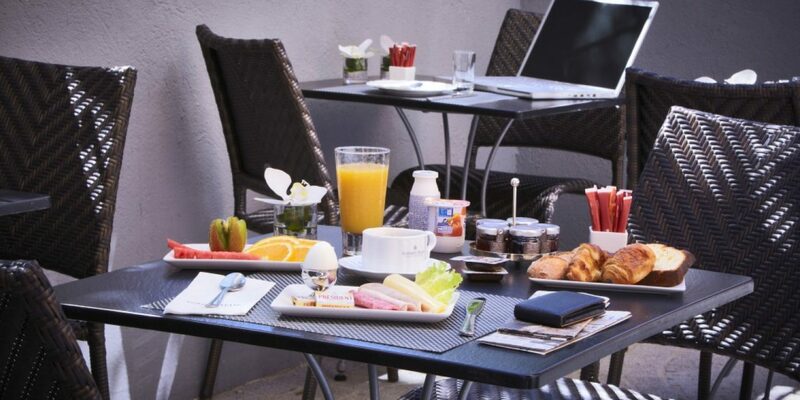 In season, our terrace is completely refurbished in an elegant "lounge", allowing you to enjoy a fresh air to wake up and the first rays of sunshine.